Investing Women’s Ambition Award open for entries! 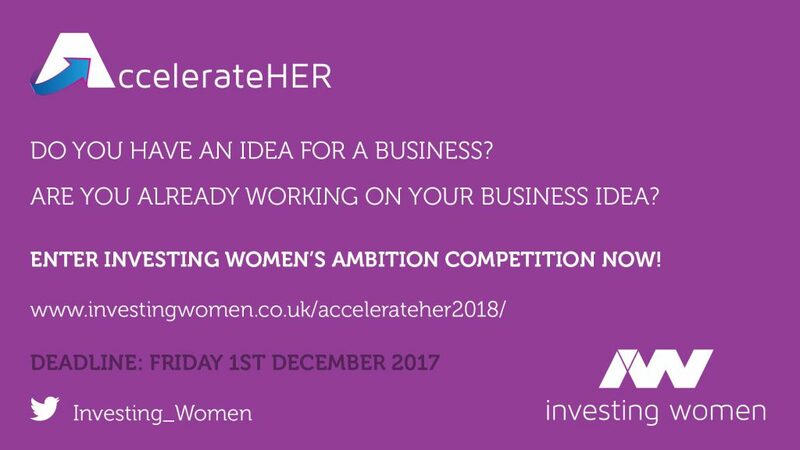 The Investing Women Ambition Award is open for entries now until the 1st December! Ambition is for early stage female led ideas (or start-ups) and comes with an impressive support package for winners. This year they have split the competition into categories and all that’s needed to enter is a 1-2 min pitch video outlining the idea/business. 19th May 2016, Scottish entrepreneurs with ambitions to grow their businesses are being encouraged to register for a free place at the Scotland Can Do SCALE summer school, taking place at Stirling University in August. Confirmed speakers for the programme include Bill Aulet, Managing Director of the Martin Trust Centre for MIT entrepreneurship, and author of 24 Steps to Disciplined Entrepreneurship and Noam Wasserman, professor at Harvard Business School and author of The Founders’ Dilemmas. The innovative residential training course will cover topics including building a team, knowing your customer, succession planning and accelerating and exiting a business. The programme is targeted at those who have already started a business and have big aspirations for growth, with 70 places available which are fully funded for eligible entrepreneurs. The four day summer school will commence at 6pm Sunday 31st July and runs until Thursday 4th August. The online course should be completed by 31st May and entrepreneurs who complete the course will be eligible to apply for the summer school. Successful applicants will be invited to attend a selection day on the 27th or 28th June in Glasgow, in which this year’s summer school cohort will be chosen. Funded and delivered by Highlands and Islands Enterprise, Scottish Enterprise and the Scottish Funding Council, and sitting under the Scotland Can Do government banner, the SCALE programme aims to develop a cohort of Scottish entrepreneurs who are capable of building world-class businesses. To take part in this incredible opportunity, entrepreneurs should visit the www.cando.scot/scale website and register today.